VIMY RIDGE, France — They came together from coast to coast to coast, by the thousands, to say thank you and to remember. Canadians of all ages and all walks of life, they gathered under the soaring pillars of the Canadian National Vimy Memorial on Sunday to mark the 100th anniversary of that fateful battle — and reflect on its enduring legacy. Exactly 100 years earlier, the scene here had been quite different. The sun that shone down on the masses on Sunday, forcing many to hide behind umbrellas lest they burn, had been non-existent in 1917. Instead, rain and sleet and artillery shells had lashed what then was a muddy, bloody battlefield as 30,000 Canadian soldiers huddled in trenches and waited for the assault to kick off. But there was one key similarity between that Easter Monday on April 9, 1917, and the scene 100 years later: Canadians stood together, shoulder to shoulder, proudly and unabashedly as one people. "These ordinary and extraordinary men of the British dominion fought for the first time as citizens of one and the same country," Prime Minister Justin Trudeau said in French as he addressed the crowd. "Francophones and Anglophones. New Canadians. Indigenous Peoples. Side by side, united, here in Vimy, within the four divisions of the Canadian Corps." The Battle for Vimy Ridge was a distinctly Canadian effort from the beginning, a true demonstration of all the best qualities that Canada represents: individual initiative; esprit de corps; gumption; enthusiasm. Unburdened by a history of warfare, the Canadians looked at war differently and adopted new tactics such as the creeping barrage while entrusting the battleplan for the first time to even the lowliest privates. But what really set the battle apart was that, for the first time in the Great War, the Canadians would be fighting all together as one single unit: The Canadian Corps. Farmers from Weyburn next to miners from Cape Breton. Lawyers from Toronto with lumberjacks from Kelowna. Doctors from Montreal and cowboys from Red Deer. And despite suffering horrible casualties during the four-day battle, with 3,598 dead and more than 7,000 wounded, they would succeed where the British and French had failed by capturing the ridge. "This was and remains the single bloodiest day in Canadian military history," Prince Charles, representing the British monarchy, told the assembled crowd. "Yet Canadians displayed a strength of character and commitment to one another that is still evident today. They did not waver. This was Canada at its best." Yet it wasn't Canada's fighting prowess that was being touted as the legacy of Vimy on Sunday: It was the creation of a country committed to peace. "Those spires stand for peace and for freedom," Gov. Gen. David Johnston said, indicating the white towers of the Canadian National Vimy Memorial behind him. "They stand for justice and hope. And they remind us that one cannot exist without the other. Without freedom, there can be no peace. Because freedom without peace is agony, and peace without freedom is slavery." 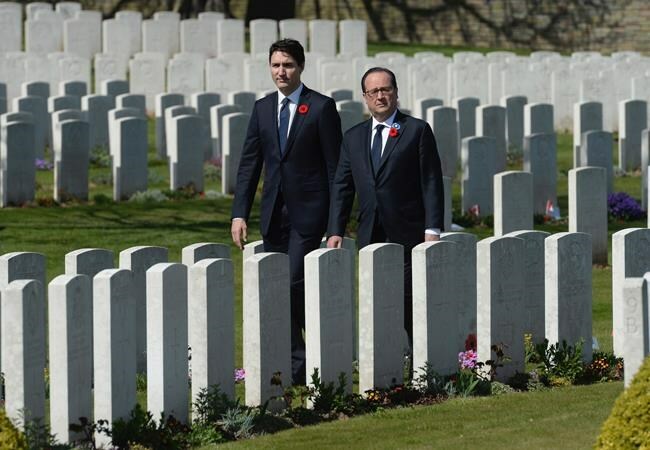 French President Francois Hollande said the "blue ghosts of Vimy" serve as a reminder, not just of what happened 100 years ago, but what "free peoples" even today must sometimes do to protect peace. "They tell us what free peoples are capable of when the essential is at stake," he said in French. With all of those who fought not only at Vimy, but the Great War, now gone, it fell to other ways to remember them and their stories. One pair of empty black combat boots for each of the men who died fighting for the ridge was placed atop the monument or on the vibrant green grass of the surrounding ridge. Meanwhile, actors took on the personas of those who lived through that terrible time, bringing not only soldiers back to life, but also their mothers and fathers, wives and even nurses. The ceremony itself was a mix of contemporary and traditional, as musical performances were followed by a lone bagpiper's mournful playing of The Lament and the laying of wreaths at Canada Bereft's feet. There was also a clear effort to include Canada's indigenous people, who played a significant role in the First World War. The emotion of the event was too much for some to bear. Speaking to a reporter afterward, Second World War veteran Stan Egerton of Burlington teared up as he remembered his father who had fought at Vimy, and two brothers killed in the conflict that followed. "I'd rather not say," the 91-year-old said when asked what he was thinking about as he looked up at the monument. Others, like high-school student Chloe McManus of East Hants, N.S., who had come to Vimy with several members of her history class, struggled to find the right words to express what Vimy meant to her. But others couldn't say enough, such as the citizens of the nearby French city of Arras, who were eager to show their appreciation. Vimy just one part of the larger Battle of Arras in April 1917, but also the most successful. During a ceremony in the city centre earlier in the day, Arras Mayor Frederic Leturque thanked Australia, Britain, New Zealand and South Africa for having fought during that larger battle. But he saved a special thanks for Canada, telling Trudeau and the hundreds of others assembled that the Canadians' actions at Vimy were "a turning point for our city and our country."